Of course, all of the pieces have interchangeable hats, and of course, it comes with a free in-game hat for TF2. If you're looking for the perfect Christmas gift for a ravenous Team Fortress 2 fan, you may want to consider the official Team Fortress 2 chess set that has recently popped up on ThinkGeek. In true hat-simulation style, each of Team Fortress 2's iconic mercenaries can wear the "hat" of any of the chess pieces, and the game, of course, comes with a DLC code for a free hat in the TF2 video game. "When the troops from Reliable Excavation & Demolition and Builders League United aren't on the battlefield, they often unwind in the green room together. They sip sodas, eat cheese-flavored snacks, and play board games. But not just any board game. They play chess. Ah, chess - that classic game that simulates two sides on a battlefield. TWO SIDES AT WAR!!! The tables flip and the guns come out. 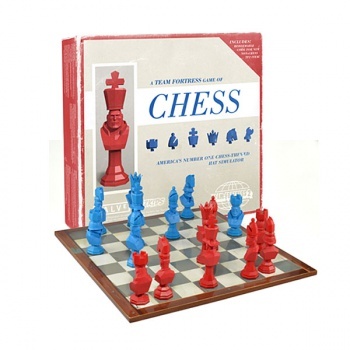 It's RED vs. BLU all over again in this Exclusive Team Fortress 2 Chess Set." The set costs $99.99 and contains everything you need to play chess. The game Board is 15" squared and each of the playing pieces are 2.5" - 5" tall. The set comes with two sets of each of the nine mercenaries to use as the special chess pieces, as well as red (a bomb) and blu (a wrench) Pawn pieces. The DLC hat included with the set, the Grandmaster Hat, actually changes during gameplay. It starts as a Pawn and levels up or down (through the chess pieces) correlating to your kill streak. $100 seems a bit steep for a simple chess set, even if it is this cool and comes with a free hat. What do you guys think? Is this going under anyone's Christmas tree?